Voice of the Canadian Footwear industry. For over 100 years, Footwear Journal has kept retailers, manufacturers, importers and distributors up to date on all aspects of the footwear business. 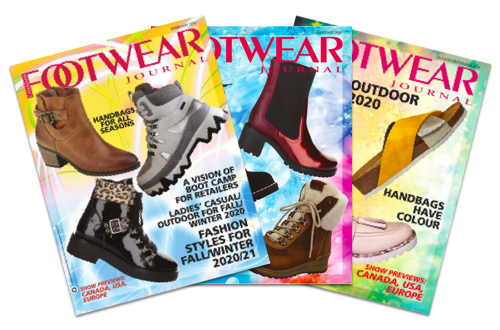 Comprehensive topical coverage in full colour of the latest styles, fashions and trends from major footwear shows in Europe and North America enable Canadian retailers to buy intelligently and sell profitably. Footwear Journal has kept pace with the people and the innovations in the Canadian footwear industry, from manufacturing to retailing, for over a century. An advertising program in Footwear Journal presents a unique opportunity to be a part of this tradition. Reach the buyers and decision-makers in Canada’s $4 billion plus retail footwear market by advertising your products in Footwear Journal. Benefit from editorial coverage to support your promotional efforts and watch your business grow. Today, more than ever, with its new interactive on-line digital edition, Footwear Journal presents advertisers with the most efficient way to reach the buyers and decision makers. Your advertisement can be linked directly to your website, on-line catalog or video clip. To get your own print copy of Footwear Journal, click on the link below, fill out the form, and send it in. Footwear Journal’s new on-line edition features patented turn-page technology and interactive hot links to supplier websites. Canada's only comprehensive directory of footwear, handbag and accessories suppliers (manufacturers, importers & distributors) with listings cross-referenced to brands and product lines. Show Previews of all the major European and North American footwear shows. plus Previews of all the major European and North American footwear shows. Men's styles for Fall 2017 and full colour spreads on fashion & comfort styles for women as well as fashion reports from European shows. Full colour spreads on Fall/Winter 2017/18 Fashion Footwear, Fall 2017 Outdoor/Casual styles, Fall 2017 Handbags as well as Leather Trends and Show Previews of all the major European and North American footwear shows. Full colour spreads on Fashion Boots for Fall/Winter 2017/18; Future Trends; Euro Show previews. Full colour spreads on Ladies’ Spring/Summer 2017 Fashion Styles, Casual/Outdoor for S/S 2017, Handbags for Spring 2017, Leather trends for Spring plus Previews of all the major European and North American footwear shows. Men's styles for Fall 2016 and full colour spreads on fashion & comfort styles for women as well as fashion reports from European shows. Full colour spreads on Fall/Winter 2016/2017 Fashion Footwear, Fall 2016 Outdoor/Casual styles, Fall 2016 Handbags as well as Leather Trends and Show Previews of all the major European and North American footwear shows. Full colour spreads on Fashion Boots for Fall/Winter 2016/2017; Future Trends; Euro Show previews. Full colour spreads on Ladies’ Spring/Summer 2016 Fashion Styles, Casual looks for S/S 2016 , Handbags for Spring 2016, Leather trends for Spring plus Previews of all the major European and North American footwear shows. Men's styles for Fall 2015 and full colour spreads on fashion & comfort styles for women as well as fashion reports from European shows. Full colour spreads on Fall/Winter 2015/2016 Fashion Footwear, Fall 2015 Outdoor/Casual styles, Fall 2015 Handbags as well as Leather Colour Trends and Show Previews of all the major European and North American footwear shows. Full colour spreads on Fashion Boots for Fall/Winter 2015/2016; Future Trends; Euro Show previews. Full colour spreads on Ladies’ Spring/Summer 2015 Fashion Styles, Casual looks for S/S 2015 , Handbags for Spring 2015, Colour trends for Spring plus Previews of all the major European and North American footwear shows. Men's styles for Fall 2014 and full colour spreads on fashion & comfort styles for women as well as fashion reports from European shows. Full colour spreads on Fall/Winter 2014/15 Fashion Footwear, Fall 2014 Outdoor/Casual styles, Fall 2014 Handbags as well as Leather Colour Trends, Retailing Roundup and Show Previews of all the major European and North American footwear shows. Full colour spreads on Fashion boots for Fall/Winter 2014; Trends to watch for and Euro Show previews. Full colour spreads on Ladies’ Spring/Summer 2014 Fashion Styles, Casual looks for S/S 2014 , Handbags for Spring 2014, Colour trends for Spring plus Previews of all the major European and North American footwear shows. Men's styles for Fall 2013 and full colour spreads on fashion & comfort styles for women as well as fashion reports from European shows. Full colour spreads on Fall/Winter 2013 Fashion Footwear, Fall 2013 Outdoor/Casual styles, Fall 2013 Handbags as well as Leather Trends, Retailing Roundup and Show Previews of all the major European and North American footwear shows. Full colour spreads on Ladies’ Spring/Summer 2013 Fashion Styles, S/S 2013 Outdoor, Handbags for S/S 2013, European fashion windows plus Previews of all the major European and North American footwear shows. Full colour spreads on fashion & comfort styles for women and men's styles as well as fashion reports from European shows. Full colour spreads on Fall/Winter 2012 Fashion Footwear, Fall 2012 Outdoor styles, Fall 2012 Handbags as well as Leather Trends, European Windows, Retailing Tips and Show Previews of all the major European and North American footwear shows. Full colour spreads on Ladies’ Spring/Summer 2012 Fashion Styles, S/S 2012 Outdoor, Handbags for S/S 2012 plus Previews of all the major European and North American footwear shows. Full colour spreads on Fall/Winter 2011 Fashion Footwear and Fall 2011 Outdoor styles as well as Leather Trends, European Windows, Retailing Tips and Show Previews of all the major European and North American footwear shows. Last look at Spring/Summer 2011, Special section on Toning Footwear, Fashion styles from Europe. Full colour spreads on Spring/Summer 2011 Fashion Footwear and S/S 2011 Outdoor styles plus Previews of all the major European and North American footwear shows. Full colour spreads on ladies’ fashion comfort footwear and men's styles for Fall 2010 as well as fashion reports from European shows. Full colour spreads on Fall/Winter 2010 Fashion Footwear and Fall 2010 Outdoor styles as well as Previews of all the major European and North American footwear shows. Sneak peek at Fall/Winter 2010 Boots and forecast for the coming year.